Hey, You Know What Surprising Free Agent is Actually Worth Discussing? Daniel Descalso! D.J. LeMahieu is one of the top 50 free agents in baseball this offseason, according to both CBS Sports (24th) and MLB Trade Rumors (33rd). And yet, when I proposed him as cheaper alternative (with some upside!) to some of the more extravagant options available to the Cubs (the ones they are all but conceding they won’t pursue), I took a bit of heat. Fine. No problem. I hear you loud and clear. Which is why I’ve adjusted my approach, recalibrated my analysis, and am ready to propose another potentially very cheap infield free agent for the Cubs to target this winter. And guess what! He’s not even on the top 50 rankings! Woo! Doesn’t that get you pumped up!? 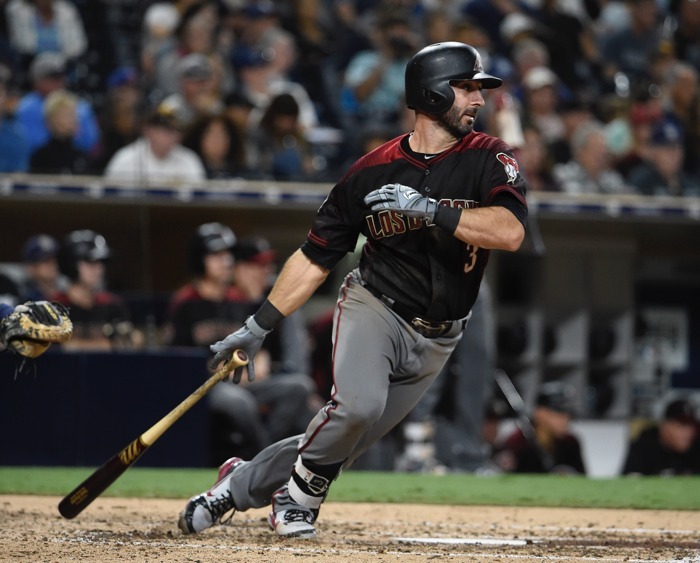 Let’s talk about Daniel Descalso. Up front, I should point out that there aren’t any existing rumors connecting Descalso, 32, to the Cubs. This is just an analysis based on the positions he can cover, his expectedly low price tag, and, what we consider to be some signals that he’s completely reinvented himself in ways that make him surprisingly compelling as a versatile addition. 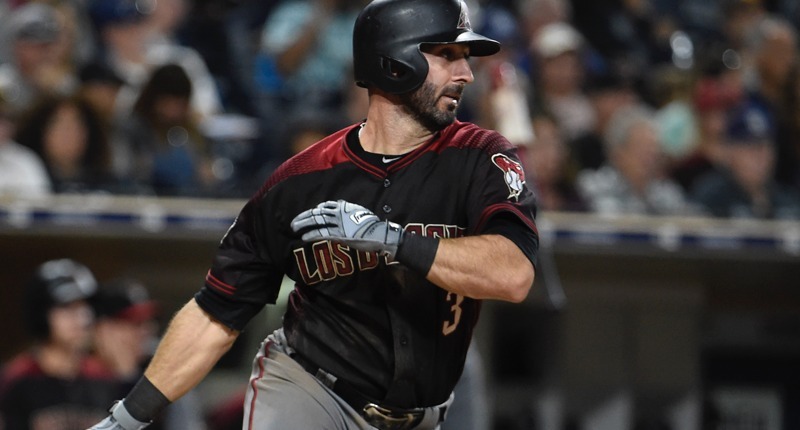 Let’s start by getting on the same page: Before the 2018 season, Daniel Descalso was pretty terrible at the plate. In the 2,276 plate appearances since his debut back in 2010, Descalso had slashed .240/.318/.359, which was good for just an 80 wRC+. In other words, for the first eight years of his career, the player I’m hoisting up to the Cubs today like Simba to the pride was 20% worse than the average big league hitter. The guy could play all over the field defensively, but he couldn’t hit. He was what he was. But last year, at age 31, the left-handed hitting, right-handed fielding defensively-versatile infielder did something totally unexpected. He slashed .238/.353/.436 (111 wRC+) in 423 plate appearances. Is that an All-Star? Nah, of course not. But it did place him among the top 75 hitters in baseball, which ain’t too shabby for a guy with his positional versatility. And, for what it’s worth, his 110 DRC+ is right in line with these numbers. But if you’re not so easily enthused, I’d understand. It’s Daniel Descalso. Even if you like what you’re seeing, and even if you recognize he might just be a nice bench guy, it’s hard to get too excited. I get it. But even still, it’s not just the final slash line of last season that gets me going, it’s how he got there, and how much he fundamentally changed as a hitter last season. Because if he can keep any of this up, he might be an even better hitter going forward. 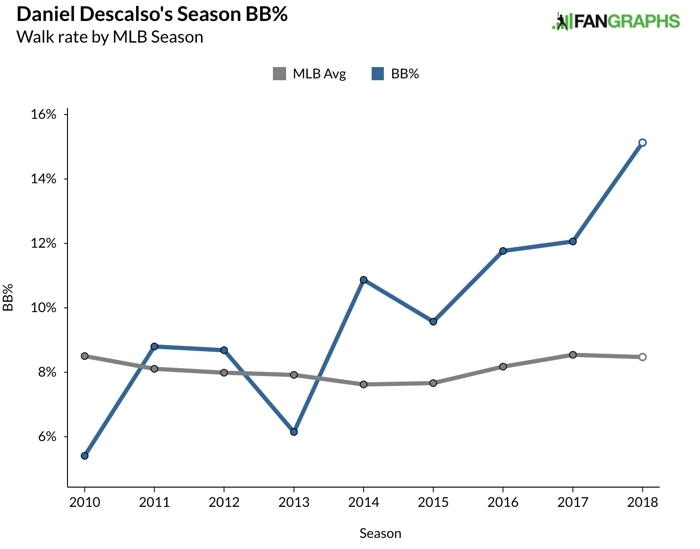 Descalso’s walk rate has been steadily climbing for – essentially – the last five years, but it hit a peak of 15.1% in 2018, which would’ve ranked 8th best in baseball if he qualified – tied with the Matt Carpenter, just one spot behind Jose Ramirez. His strikeout rate has climbed a bit, too, but he was actually swinging at fewer pitches out of the zone than usual and the same amount of pitches in the zone as he ever has. But with lower contact rates across the board, it’s easy to surmise he was swinging for more power. Wow. What was an already widening gap starting in 2016, absolutely rocketed off over the last two seasons. 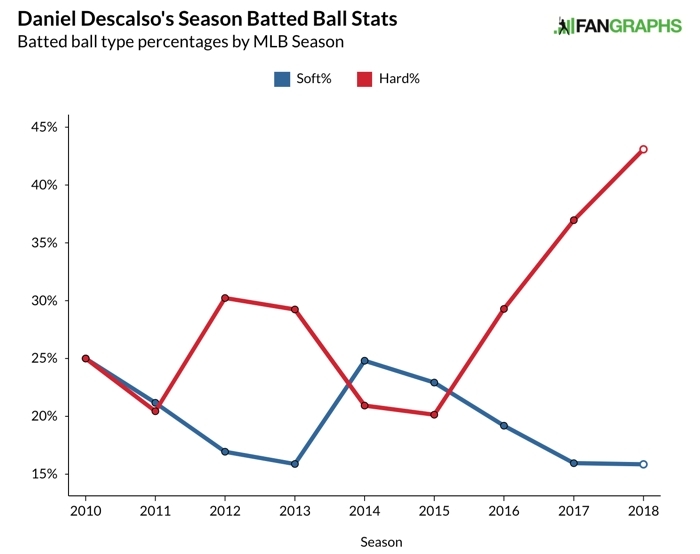 Daniel Descalso learned how to barrel up the ball big time – thanks primarily, it seems, to pulling the ball a lot more with a better angle on his swing – and his soft hit rate has plummeted while his hard hit rate has SOARED. All this sure looks like someone locking onto the launch angle revolution, meshing it perfectly with his existing skillset and ability to change/adapt. And, as I’m sure you can imagine, his .198 ISO last season was by FAR the biggest of his career. But that’s sorta what’s so exciting about him. Despite not even being recognized as one of the top 50 free agents of the winter, he was one of the top 75 hitters in baseball last season … and for good, fundamentally sound, statistically-confirmable reasons! He’s getting older, but if the Cubs were looking for a really high-quality utility player who could start in a pinch, they can do a lot worse than Descalso. 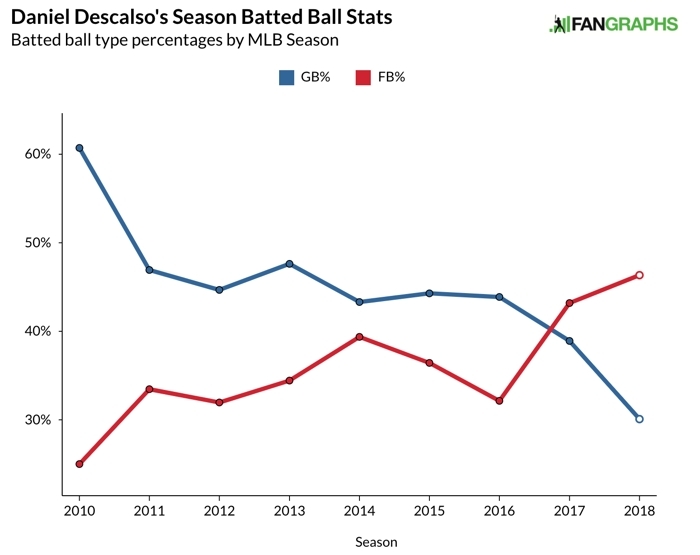 To play devil’s advocate with a final note: Descalso absolutely faded down the stretch last season. After slashing .257/.375/.465 (125 wRC+) through his first 350 plate appearances, he hit just .154/.247/.308 (45 wRC+) over his last 75 PAs. That shouldn’t be over-weighted, but it also cannot be ignored. He also had a pretty huge reverse split situation going on last year, hitting .286/.365/.524 (134 wRC+) off of fellow lefties, and just .227/.351/.416 (107) off of righties.